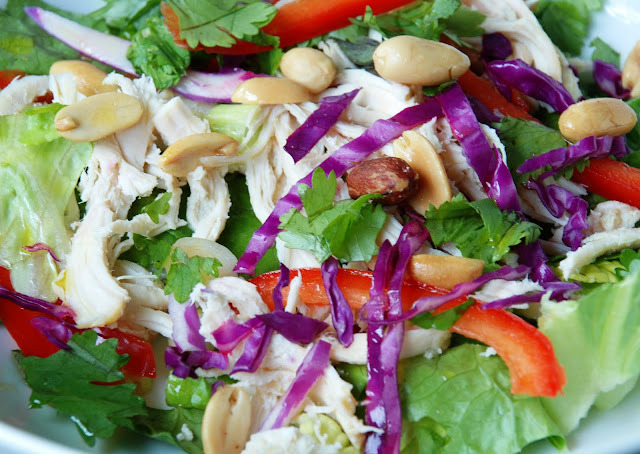 This really good summer salad has the best texture because of the shredded chicken. The technique is simple: Holding a fork, tines down, in each hand, pull the meat into pieces along the grain. Make dressing: In a blender, combine cilantro, lime juice, and oil; season with salt and pepper and a little sugar to taste. Blend until smooth. In a large bowl, combine chicken, cabbage, bell pepper, and scallions; season with salt and pepper. In another large bowl, toss lettuce with 1/2 cup dressing. Divide among four bowls, and top with chicken mixture. Drizzle all with remaining dressing, and sprinkle with nuts.